BEIJING, China (CNN) -- A U.S. athlete who overcame the chaos of war in Sudan to become a middle-distance runner in the United States will carry the American flag during Friday's opening ceremony of the 2008 Summer Games. Lopez Lomong competes during Olympic trials in Eugene, Oregon, last month. 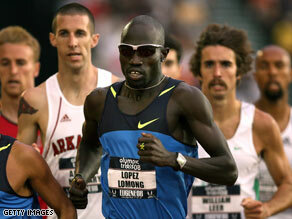 Lopez Lomong, a 23-year-old competitor in the 1,500-meter race, will lead the U.S. Olympic team as the flagbearer. Teammates chose him Wednesday, the U.S. Olympic Committee said in a statement. Lomong is a member of Team Darfur, a group of athletes committed to raising awareness about chronic violence in the Darfur region of western Sudan. He was among roughly 3,800 refugees, dubbed the Lost Boys of Sudan by reporters and aid workers, who were resettled in cities across the United States. Nearly all were boys who had been separated by relatives during fighting in Sudan. They endured months of wandering during which thousands died of hunger, disease or attacks by bandits or wild animals. Human rights groups have faulted China for doing too little to pressure Sudan, its trading partner, to halt unremitting bloodshed in the Darfur region. An estimated 300,000 people have died and 2.5 million have been forced from their homes in a campaign of violence in Darfur that the United States has condemned as genocide. The Chinese government this week revoked the visa of Team Darfur's co-founder, speedskating gold medalist Joey Cheek, the group said without offering a reason. Lomong said he is thrilled to be a flagbearer. At age 6, Lomong fled his home in southern Sudan with his family to escape an attack but became separated from his relatives, the USOC says. He ended up in a refugee camp near the border of Sudan and Kenya, the USOC says. Lomong was uprooted in 1991 by a grinding civil war in Sudan that pitted black southerners who practiced Christianity and animist religions against a government dominated by Arab Muslims from northern Sudan. The north-south war in Sudan killed 2 million people and displaced 4 million others before a 2005 peace deal ended the fighting. Yet violence still rages in the unrelated conflict that erupted in 2003 in the western region of Darfur. Lomong spent 10 years in the refugee camp before the U.S. government resettled him as a refugee in the town of Tully, in upstate New York. Lomong attended high school in Tully and went on to Northern Arizona University. He became a U.S. citizen in July 2007. "The American flag means everything in my life -- everything that describes me, coming from another country and going through all the stages that I have to become a U.S. citizen," Lomong said in the USOC statement. "This is another amazing step for me in celebrating being an American."